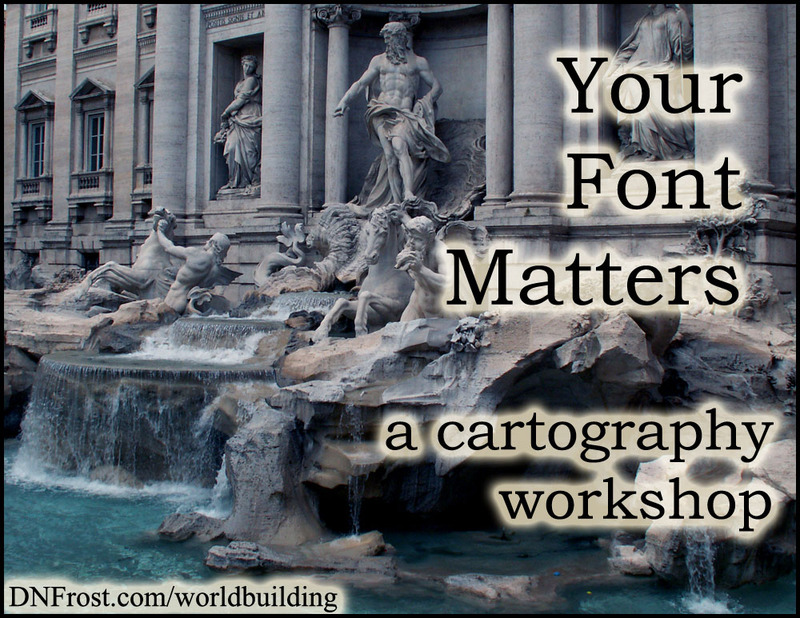 When mapping your world, a few factors impact the overall feel of your map. Visual cues communicate information about your world at a subliminal level, and your readers absorb this information within moments of glancing over your map for the first time. While your colors and mapping style create the general atmosphere for your map, your font is what really embodies the spirit of your world. It can be tempting to pick ornate fonts with grand details, but fancy fonts rarely work for cartography labels. Ornate fonts are often obscured at smaller sizes, so your best bet is to select a simple font that's easy to read. A map can backfire when the font is too hard to decipher. If you have your heart set on a particular font that won't work for small labels, use it for the largest labels and pick a simpler font for the rest. In addition to simplicity, your font style needs to convey the spirit of your world. Curly fonts often seem cheerful and provide for an idyllic feel, whereas Gothic fonts can feel gloomy and impart a sense of danger or foreboding. Scripts that resemble handwriting elicit an older setting than modern fonts, which evoke a sense of technological advancement. To portray a medieval or ancient world, try fonts that appear to bleed into parchment or be carved into stone. Combined with astute color selections and the style of your map, the font you select establishes certain expectations in your readers. In these Cartography Annals of the Known World, you can see how I decided upon the colors, styling, and font for my own maps. By choosing a legible font that captures your world, you can prime readers with the right expectations, so they can experience your work as you intended. A spot-on map will also draw the right interest, from people who will enjoy and share your work.